It’s Frugal Fashion Friday and this week I am bringing you a round-up of outfits! We have had so many and I don’t want you to miss on great these great deals. 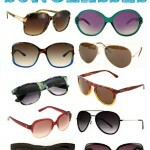 Follow all Frugal Fashion Friday Posts and espeically take a look at this weeks sunnies – Frugal Fashion Sunglasses Deals! the Pink Chevron Skirt – Pin It, Perfect for Spring and Summer, wear the Chevron Trend of the Season! the Navy Summer Outfit – Pin It, Jump on your Yacht and Pair Navy, White a a hint of Nautical Stripes! the Navy and Gold Outfit – Pin It, Many color choices with this crochet top! the OTHER Gold and Navy Outfit – Pin It, This strechy pencil skrit will be forgiving! the Crochet Dress Outfit – Pin It, You will love how easy this dress is for the summertime season! the Spring Aztec Skirt Outfit – Pin It, Another pattern to adorn – Aztec is hot, especially in pastels! 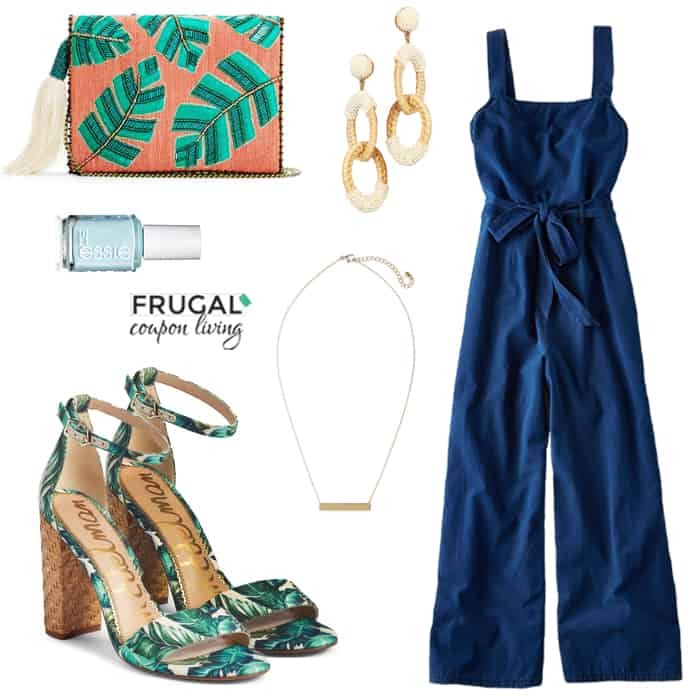 the Spring Outfit from Target – Pin It, You can have it all from Target, this blue maxi and all acessories are from your favorite one-stop shop! the Neutral Palette Outfit – Pin It, Seriously one of my favorite outfits. Keep it simple and add a little bit of detail. the Spring Break Ready Outfit – Pin It, Grab your fedora and this beautiful necklace. We mix mauve and blue in this outfit. the Dressed Down Little Black Dress Outfit – Pin It, Have a black dress you can dress up or even dress down with a turqouise necklace and jean jacket! the $14.99 Leopard Skirt Outfit – Pin It, Grab a crop top, pull of a breezy flowing skirt, and stand out in this cheetah pattern. 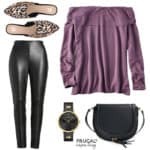 the French Connection Jacket Outfit – Pin It, This designer jacket is a HUGE Savings! Plus it can go with so many colors. the Valentine’s Day Pants Outfit – Pin It, Bring the red down to your legs with this dress up pants outfit! Perfect for a special evening. the Valentine’s Day Dress Outfit – Pin It, Stand out and wear a cheetah red dress! Dress it up and change the style with a leather jacket! the Winter Weekend Outfit – Pin It, Mix an open cardigan sweater with a scarf and flannel shirt. Perfect for colder months. the New Year’s Eve Outfit – Pin It, This designer gown is drastically reduced. Look like a million dollars when you pair with stand-out jewelry. 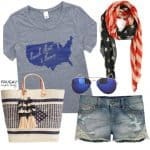 the Travel Airplane Outfit – Pin It, Stay comfy and look cute! This outfit will stay with you on red-eyes or mid-day airport sprints! the Sweater Dress Outfit – Pin It, A very popular look. Wear a neutral sweater dress and adorn with a stand-out scarf. the Black Friday Themed Look – Pin It, Wear Black all the time, not only Black Friday. This outfit is perfect for a night out. People might confuse you with someone famous! the Casual Aztec Sweater – Pin It, Think outside the box and don’t stop at a jean shirt. Layer with a chunky sweater. the Thanksgiving Outfit – Pin It, Want to look good but not dress too nicely, wear a nice dress and layer with a chunky cardigan! the Kenneth Cole Dress Sale – Pin It, You can dress up a dress with cheapest of accessories like this Geometic Necklace. the Jessica Simpson Jacket Sale – Pin It, We saw nice savings on Jessica Simpson Jackets and paired the look togehter. Sometimes a crop jacket is fine for winter when you pair with longer sleeves. 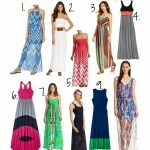 the Designer Corey Lynn Dress – Pin It, Where we started, this Corey Lynn Dress was a steal. You might have seen on Instagram, even I picked it up! 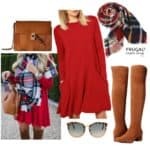 Another fun Frugal Fashion Friday, check out this outfit perfect for the Fall and Winter. Pairing the perfect accessories to a relaxed jean shirt and a pair of black leggins allows you to dress up your outfit for the perfect lunch or afternoon shopping outing. Women’s Off-White Aztec Cardigan $19.66. Aztec prints have become the style this year. From summer to fall, the continue to carry strength and make statements. It’s also a huge print this season. On this sweater, shipping adds $1.69. Note: Also keep an eye out on Jane and GroopDealz which both have featured Aztec Fashion Sales. Women’s Denim Fitted Button Front Shirt This shirs is sold out, but grab this Chambray shirt for under $20. $53.99 form $129.99. Has the style of Denim ever left? The white washed and relaxed comfort of a jean shirt is here. 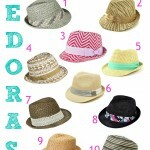 These can be toned down or dolled up depending on the accessories or accents you use. I also recommend looking at your local Marshall’s or TJMaxx. Some can be found at Target too for around $18 to $24. Simply Vera Vera Wang Solid Leggings $14.28 $16.80 from $24. Over 300 reviews and over 4 stars – these Simply Vera leggins are pretty popular! Use code SHOPEARN for 15% off making them only $14.28. Code expires 11/27/13 but Kohls ALWAYS has codes! Check out Black Leggings on Kohl’s website, at Target’s website or on Amazon. Nabila Boot – $31.95 from $69. A stunning over-the-knee boot for those tall orders. Equestrian-inspired and perfectly crafted from plush material. Features a buckle detail, tab behind the top shaft and a low stacked heel. You guys KNOW I love JustFab Boots and their B1G1 sale. I have shared with you before a great way to get discounted Fall boots. Hepburn Tan Purse $14.95 from $69 Ultra chic structured tote for the urban sophisticate or suburban socialite. Luxe pebbled material, reinforced handles, shoulder strap and spacious, pocket-lined interior – Another awesome JustFab find! OPI Over The Taupe Nail Polish $7.81 from $9. Nail polish is the easiest and cheapest way to use a trend and make a statement. Neutral colors like grey, taupe, golds, and blushes are great for the fall season. Try to be daring and use a black or navy blue! Bid Cage Necklace $2.99+. When trying a new trend, always go cheap and frugal – who cares how well something is made when it is temporary. When going classic, invest because this something you can use over and over. Right now bird cages and other animal accessories are in. Try out a bird cage necklace starting as low as $2.99. Gold Shaped Stud Earrings Set $2.95+. If you have accessories that make a big statement (perhaps in this case the oversize sweater and long necklace, go simple on the other pieces – aka earrings on this outfit. Just what I was saying above on the necklace, when buying a temporary fashion, go cheap! Shipping adds $2.95. If you don’t have sensitive ears, spend under $6 for try out new trends – care to be daring and put on the cross bones and skull? 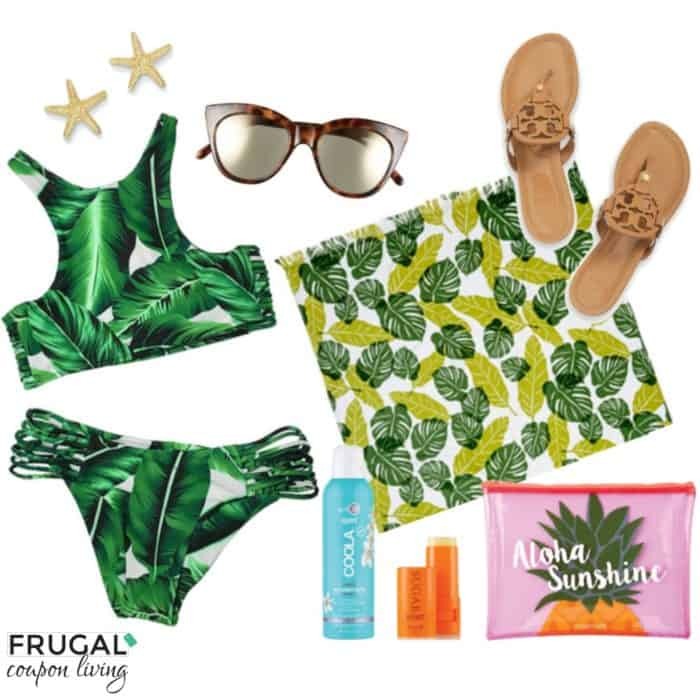 Reminder – follow Frugal Coupon Living on Instagram and Pinterest for other Frugal Fashion designs and finds! Like the Women’s Thanksgiving Outfit? 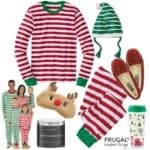 You can find more Frugal Fashion Deals on Frugal Coupon Living. 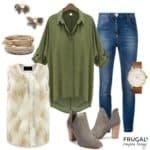 Don’t forget, find more Frugal Fashion Friday Outfit, the Thanksgiving Outfit, the Kenneth Cole Dress Sale and the Jessica Simpson Jacket Sale from the weeks before. SO MANY MORE TO COME! You asked and it’s back – Frugal Fashion Friday! This week check out the the Kenneth Cole Dress Sale plus a Frugal Fashion Outfit pairing! First, I shared before with you the FREE Shipping service called ShopRunner. This is always helpful when I shop Lord & Taylor, and for the RECORD – Lord & Taylor is my personal secret (please take note!) ShopRunner is a stand alone service that offers FREE S&H on well-known sites including L&T. When you shop online it is not a site you have to go “through” the site to get your FREE S&H. There are no minimums for the FREE 2-day S&H offer. Kenneth Cole New York Geometric Print Shift Dress With V-Back – $24.95 from $148. Head to Lord & Taylor and search web ID 0100-SW303WD10. You will find the dress for $24.95. You can also head over to the right of the site and search Sale and then Clearance (I shop there routinely for special events, you can often find clothes over 70% off!) Also, right now you can get 15% Off Regular, Sale & Clearance items plus grab an Extra 10% Off for L&T Card members with code VETSDAY this makes it $21.20 (or $18.71 for card members with 25% off). Update: this dress is going fast – HURRY! Faux Leather Asymmetric Zip Jacket is only $19.99 from $100. It is similar to the one above and I found at Marshals for $29.99 (see Instagram). Also, Amazon has plenty of Faux Leather Biker Jackets . Marguax Boot – 19.96 from $49. You know my love for Just Fab. Make your point flawlessly with this gorgeous faux leather boot. Features hardware detail and slim stiletto. You guys KNOW I love JustFab Boots and their B1G1 sale. I have shared with you before a great way to get discounted Fall boots. Gold and Black Enamel Triangle Spike Geometric Necklace – $5.98 shipped from $40 – As seen on celebrities, I love this black and gold geometric necklace. Essie Nail Polish in Licorice – $5.92 shipped from $8. Of course the perfect accessory to any look is a manicure. I am loving anything black, gold or silver as a statement on your nails. Love to see a great brand at a discounted price! Hard to beat this Essie polish for under $6 shipped. 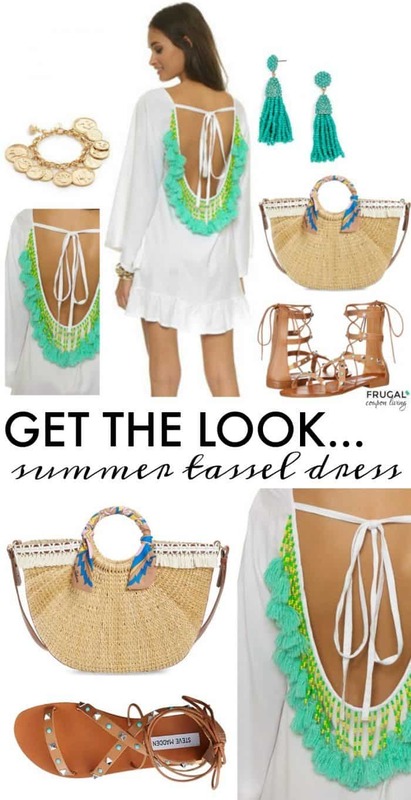 Reminder – follow Frugal Coupon Living on Instagram and Pinterest for other Frugal Fashion designs and finds! 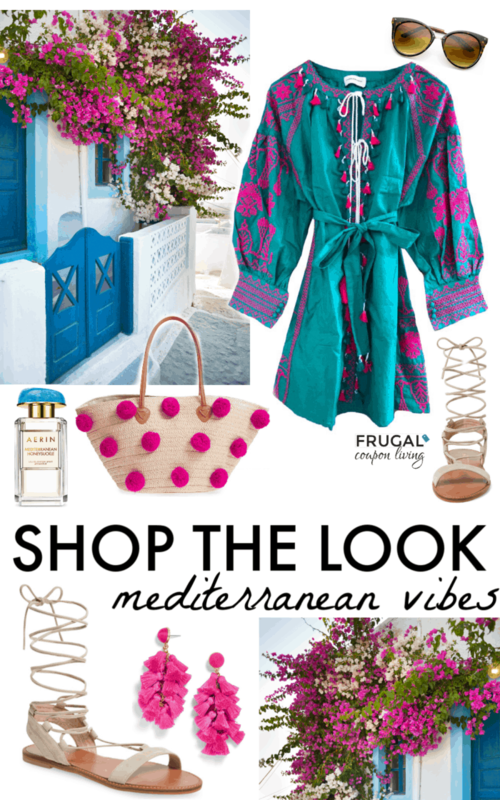 Follow Frugal Fashion Deals on Frugal Coupon Living. 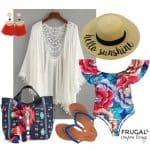 Don’t forget, find more Frugal Fashion Friday Outfit and the Jessica Simpson Jacket Sale from the weeks before. SO MANY MORE TO COME! 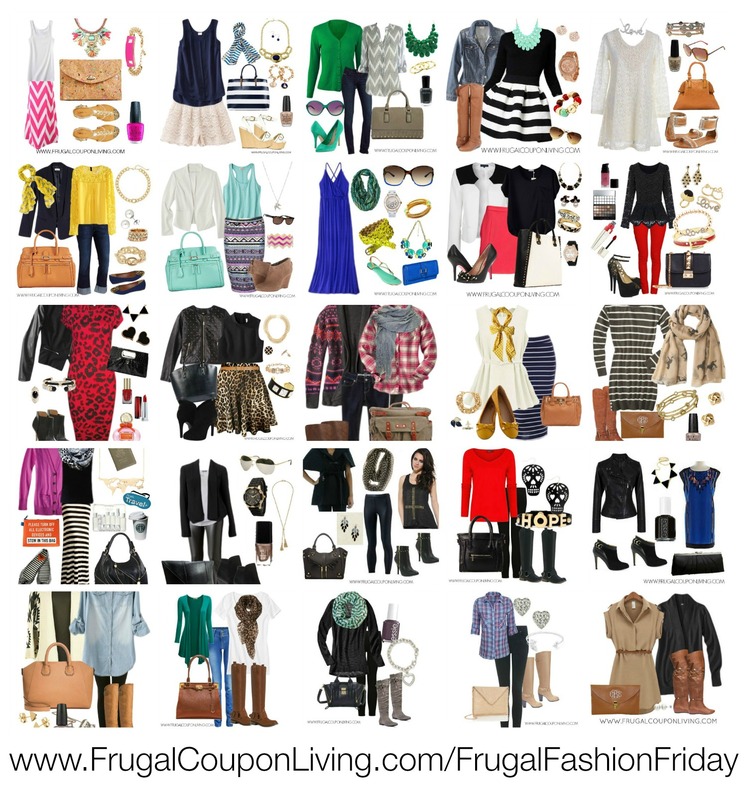 You asked and it’s back – Frugal Fashion Friday! This week check out the the Jessica Simpson Jacket Sale plus a Frugal Fashion Outfit pairing! First, I shared the Jessica Simpson Jacket Sale with you last week. We know black is a season design and pairing it with Gold also provides a nice little pop! I worked to simplify the accessories because you want justa few items to make a statement like the intricate design on the shirt or the pop of the cute earrings. Derek Heart Faux-Leather Leggings $14 from $28 Looking for the edgy look of leather without the cost, check out these pants! Great for wearing with a tunic or large flowing top. When trying a trend or something new, start of cheaper…. Trends can be temporary though we have never seen leather run out the door! Women’s Metallic Stud Cross Drop Back Top $20 from $36.95. If you want a casual laid back look this gold stud cross metallic drop back vest is ideal. I love the cute accent zip fastening on the back. Anyone else loving zippers that show? Other tanks to check out – Gold Thread Loose Knit Tank in Black $16 from $72 and Black Studded Cross Tank Top $13.50 plus $4.29 shipping. Domenica Short Boot $19.96. Make your point flawlessly with this gorgeous faux leather bootie. Features hardware detail and slim stiletto. You guys KNOW I love JustFab Boots and their B1G1 sale. I have shared with you before a great way to get discounted Fall boots. East End Purse with Blue Lining $39.95. This plush purse features rolled handles, bold gold tone hardware, zipper embellishments and sought-after snakeskin-emboss accents on exterior pockets. Another great JubFab find! Also consider this STEVE MADDEN bag for $52 which has done well on Amazon and Ideeli. Cotton Chevron Infinity Scarf $7.95. I love the blending of black and gold in this scarf. Scarves as an added touch and pop to a fashion look. There are two places to shop for this HOT Deal. Grab it on the Fashion Friday Cents of Style Sale for 11/1 or Grab it on Amazon. Both include FREE Shipping. EXCLUSIVE EARRINGS DEAL JUST FOR FRUGAL COUPON LIVING READERS! Leaf Chandelier Earrings – $5.99 from $14.95. I was able to score this exclusive earring deal JUST FOR YOU. Place a pair of Leaf Chandelier Earrings in your cart for $14.95. Use coupon code LEAVES to reduced it from the regular price of $14.95 to $5.99! This code also comes with FREE shipping Grab the adorable grey, black and gold (or another color) earrings to complete the look. 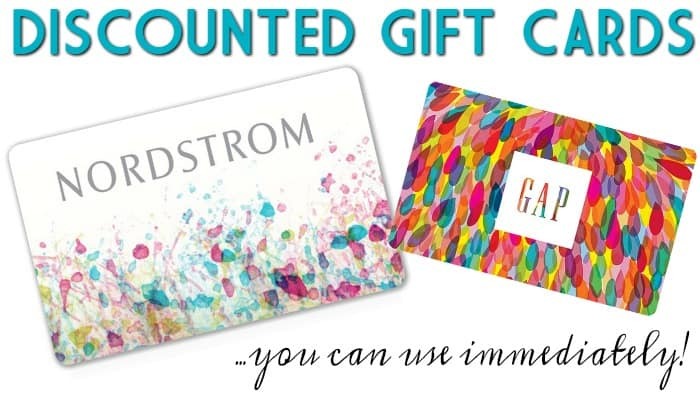 Reminder – follow Frugal Coupon Living on Instagram and Pinterest for other Frugal Fashion designs and finds! 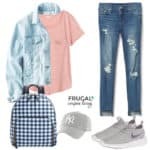 Don’t forget, find more Frugal Fashion Friday Outfit from the weeks before. SO MANY MORE TO COME!